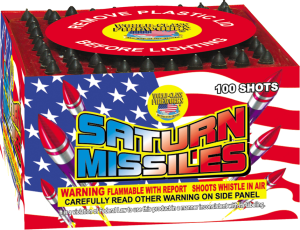 Saturn Missiles contain a barrage of stickless rockets that fade into the sky with whistles and reports one after each other. Choose from 25, 100, 250 and 300 shot versions. They can have: rapid fire action, multiple color tracers, as well as added crackling effects. There is also a 500 gram version with 750 shots.